How many of you have started your holiday shopping? Anyone finished? I like to be on the early side of it…I usually start around Halloween and try to have it finished the first week of December. Then I can enjoy the rest of the month, without so much stress. That’s my plan every year, anyway…sometimes it doesn’t always work out that way, though! 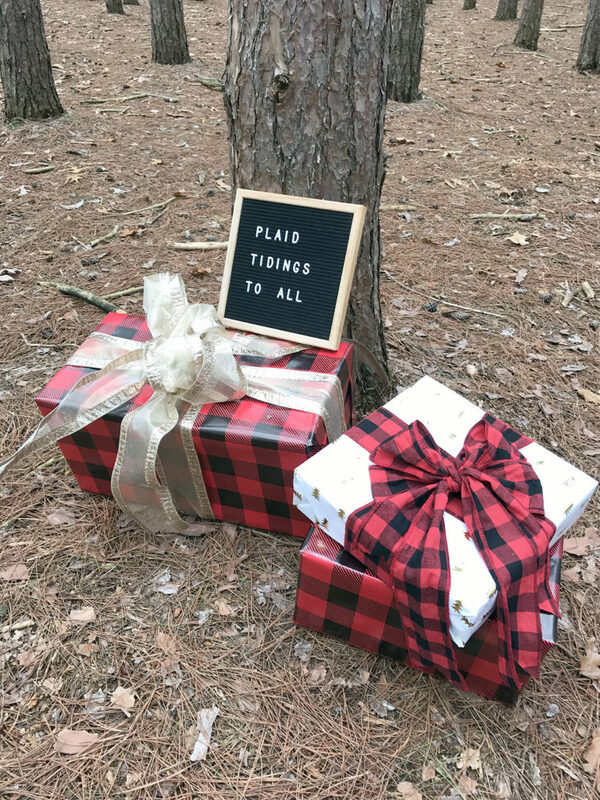 While I am not one of those bloggers who will put out several different gift guides (for the various people in your life), I thought I would share some ideas that have come my way recently…either I’ve purchased these items for myself or friends and family, OR I’ve been gifted one of them. Not only do I love THIS PURSE, but I adore just about everything on the GAIA website…and their mission of empowering refugee women living in the U.S. gives your shopping even more purpose. Be sure to check out their JEWELRY and their APPAREL…the rina tops are so lovely. 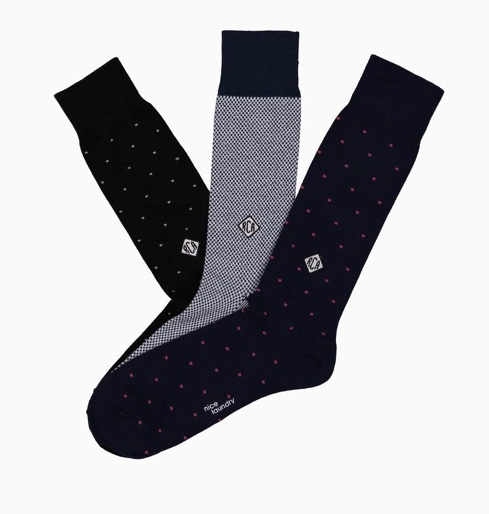 Now what man wouldn’t like a set of monogrammed socks from NICE LAUNDRY! I’m sure he won’t lose them, with his initials on them. You can customize a box by choosing from various patterns and colors, also. A great stocking stuffer! I spotted ads for this gift idea when we were on the subway in NYC last winter, and I remembered it when it was time to birthday shop for my mom. She just recently told me that she really enjoyed the monthly subscription. They offered many choices for her book selections, and even allowed her to skip a month if she wasn’t ready for another book. 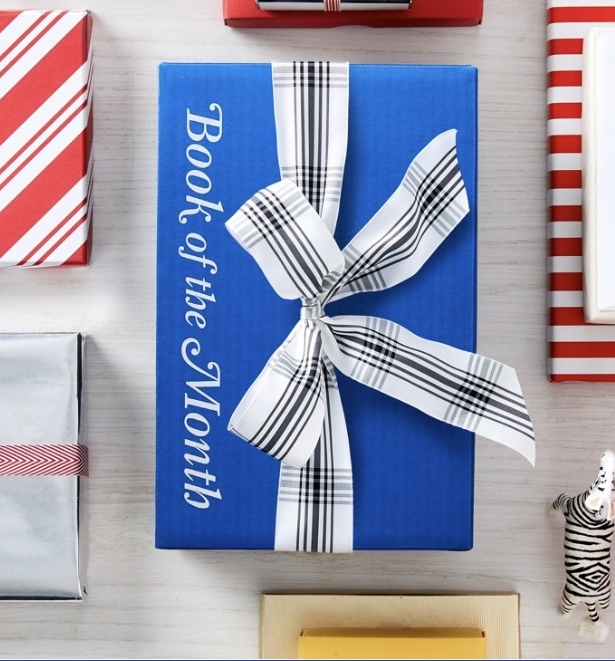 I will definitely be giving a BOOK OF THE MONTH club subscription to the readers on my list! 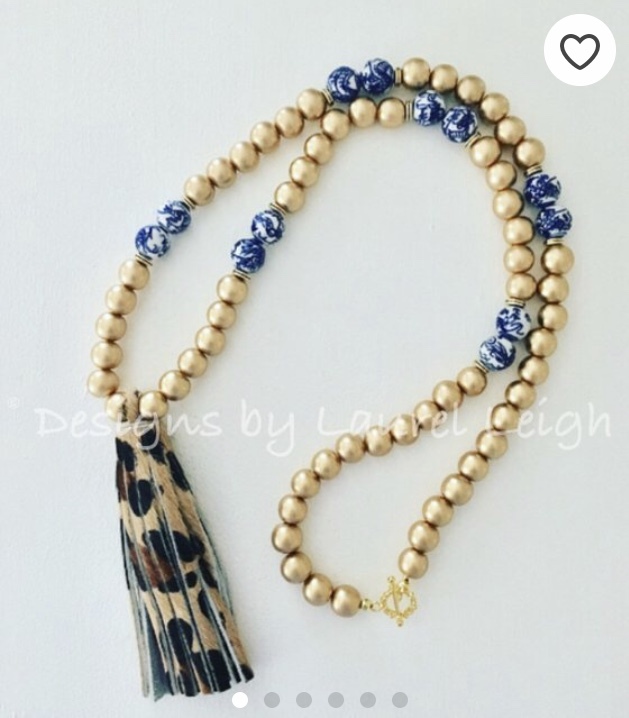 I discovered LAUREL LEIGH DESIGNS on Etsy a few years ago, and I just love all of her jewelry. So many fun designs, and very affordable! Plus I love supporting small businesses! 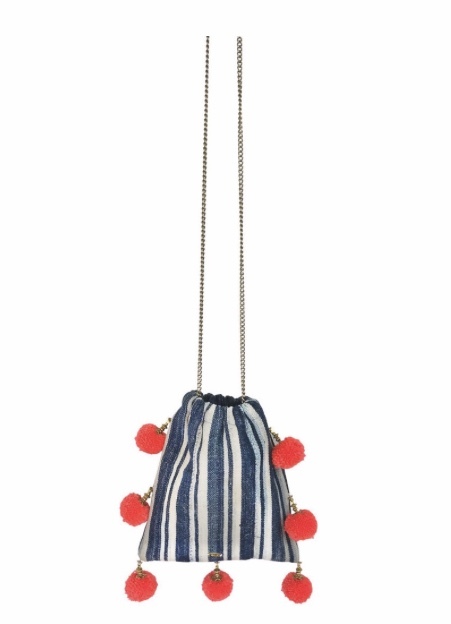 Isn’t THIS NECKLACE design of chinoiserie and leopard print tassel a fun one? 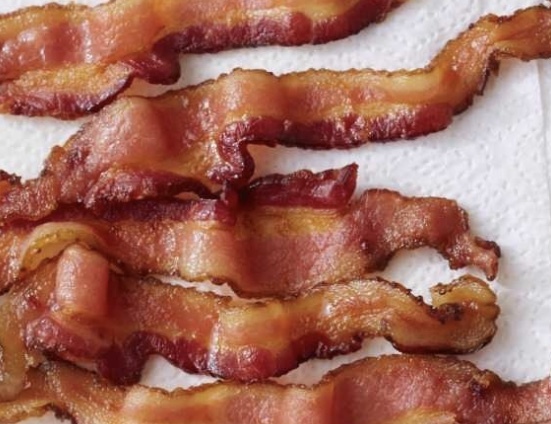 Who doesn’t love bacon…well, maybe not the vegans and vegetarians in your life! But everyone else will love this gift, I promise. I have given the ZINGERMAN’S BACON CLUB to several friends and family, and it is always quite popular. They offered a 3, 6 or 12 month option for gifting. The recipient will continue enjoying the gift over the coming months…and maybe you’ll even be invited over for brunch one morning! 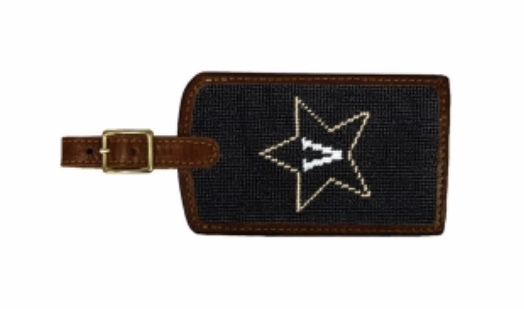 These needlepoint LUGGAGE TAGS from SMATHERS & BRANSON are a fun stocking stuffer! You can choose from many designs, including collegiate logos. Their BELTS make great gifts, also…ask my husband, as I gave him one as an anniversary gift earlier this year. Perfect gifts for that ‘hard to shop for man’ on your list! 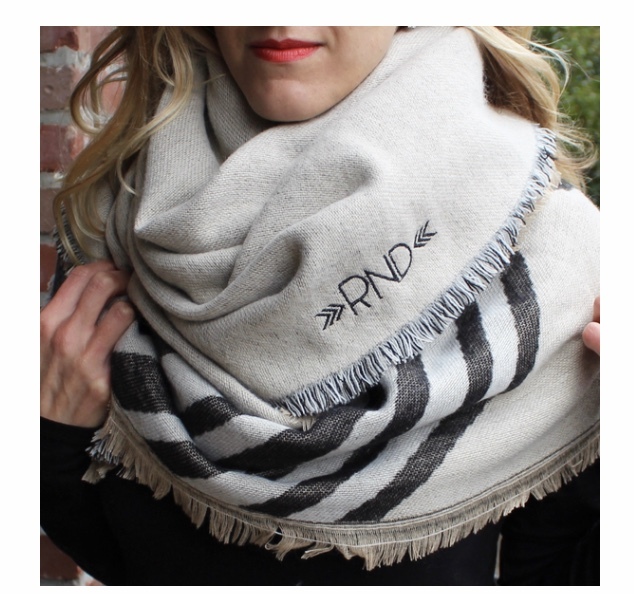 Another one of my favorites…THESE BLANKET SCARVES from ROSA GOLD! I purchased one for myself last fall, and I loved it soooo much that I have given it as a gift to many people. So functional, as well as stylish…and the monogram option gives it such a personal touch. 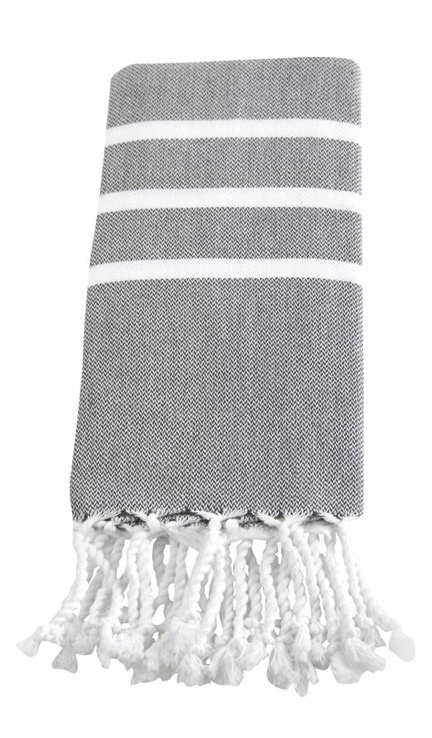 I love these TURKISH HAND TOWELS so much that I have them in two of our bathrooms. They come in a variety of colors to match your decor. I love that they are stylish and soft to the touch…and they still look new after many washings. A great gift for a new homeowner! Yes, these are edible CHOCOLATES…but don’t they look like little pieces of artwork?!? MAGGIE LOUISE CONFECTIONS are so pretty that you won’t want to eat them, but trust me…the flavors are scrumptious! 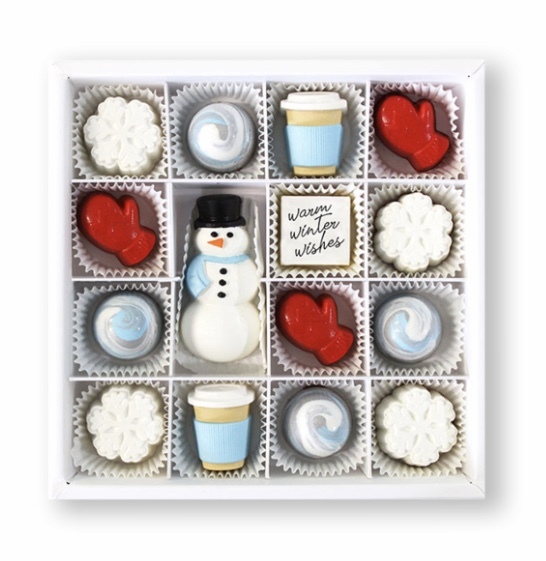 She offers a variety of sizes and assortments, and they’re made in the U.S. A perfect gift for the neighbors or a school secretary! FACEPLANT DREAMS offers many comfortable items for lounging and sleeping, but I especially love their ROBES! Made of bamboo, this kimono style has pockets and is super soft, cozy and breathable. Can you tell that I have one? Let me assure you…any mom would love it! I hope you found some inspiration for the people on your holiday gift list!